A proposition for the Madame. “Has anybody seen that little fox with the ridiculous ears?” asked Mini. She was a black mass in Sekayi’s lap once again, indolent and indignant. Sekayi periodically scratched her chin and smiled. He had lit the fire and was sitting by it with a pan, letting the flames heat the metal so the meat within hissed and popped with liquid. Mhumhi looked up from where he had been playing with Tareq, a game that involved digging a hole in the garbage as fast as the puppy could fill it up again. Tareq tossed a heavy battery against one of his forelegs and he winced. “I don’t really mind if he keeps himself scarce,” was Kutta’s comment. She was sitting atop a garbage pile a few meters away, her ears rotating and her nose twitching. A few white birds were circling high overhead. “I don’t know about that,” said Mhumhi, and she turned and gave him a malevolent look around Sekayi’s back. Mhumhi wagged his tail. She had been a bit sharp with him ever since he had returned with Sekayi and the meat. Mhumhi found himself more amused than anything else over her jealousy. He received offended silence to this, and wagged his tail harder. There was a clatter, and they all looked back over at Kutta. She was scrambling over a rapidly tipping pile of metal shingles, and now she jumped, snapping her jaws at the air. A white bird spiraled higher upwards, scolding, as she came down hard. “Almost,” said Kutta, licking her lips, still gazing upwards. “Well, they’re just animals,” said Kutta, her brush-tail bristling. Mhumhi’s heart sank a little, and he looked back across the fire. Hlolwa’s half-lidded eyes were on them again. Nobody said anything for a moment, and then Mhumhi let out a little sigh through his nose. Hlowa’s eyes flicked at him, amused and sardonic. She seemed to take care to remind them of her presence as soon as they started to really forget about it- as soon as they started to feel slightly comfortable again. “Shh,” said Tareq, frowning, but to Mhumhi’s relief Hlolwa took no action. Sekayi pulled the meat off the fire, prodding it with a stick as it made crackling sounds of protest in the pan. It had gone gray, like the meat the bouda had once given him, Mhumhi observed. He was not sure why they seemed to prefer it that way- it was harder to chew and the flavor was wholly different. “Mhumhi, over here a moment,” called Mini, poking out around Sekayi’s back again. Tareq put a hand on the side of his head and made a face at him. Mhumhi stepped close beside Sekayi. “Yes,” said Mini. She was casting unfriendly pop-eyed glances at Mhumhi, which he did his best to ignore. “Mini,” said Sekayi, lightly tapping her nose. Mini sneezed unapologetically. “I wanted to change his bandages, too, but I suppose that’s going to be impossible,” said Sekayi, casting his eyes downwards. “I can,” said Mhumhi, and turned his nose towards Kulwe, who at a few feet away had certainly been privy to the whole conversation. He had raised his head slightly and fixed his eyes on Sekayi. Mhumhi did not like that very much (and neither did Mini from the tiny growl she let out) and he went over at once and tugged on a corner of the pillow. The resounding jerk made Kulwe tense and flinch. Kulwe made no sound, though his displeasure was evident in his silently straining muscles. His rear leg, which Sekayi had tightly bandaged, shivered uselessly. Mhumhi went around and took him by the scruff, and not particularly gently. Kulwe made a thin, high noise as he began to tug him backwards. Mhumhi was startled by the amount of heat emanating from the skin in his teeth. He almost certainly had a bad fever. Mhumhi pulled him down and away from the pillow, as Sekayi went around and pulled on the other side. Sekayi himself looked mightily unhappy, gazing down at the shuddering, panting dog, and Mhumhi continued to drag him backwards towards Hlolwa. For a moment he opened his mouth, as if her were going to speak, but a swift yap from Mini stopped him. “Be careful, Mhumhi!” called Kutta, bounding closer. Mhumhi dropped Kulwe’s scruff and whirled around. Directly behind him, stretching her chain taut, stood Hlolwa. The order rankled, but Mhumhi bent down and took up Kulwe’s neck again, ignoring Kutta’s worried whine. Hlolwa paced back and forth and then, as Mhumhi jerked him closer, lunged forward and caught the loose skin on Kulwe’s hip in her teeth. The dog gave a surprised squeal, and Mhumhi stiffened in alarm. But she seemed to be only yanking him closer, tugging backwards with startling strength, so that his haunches were nearly touching her stake. Kutta made a low sound, but Mhumhi did as she said and retreated, stepping backwards towards the fire. Hlolwa put her teeth into the bandages and ripped, ignoring her companion’s whimpers. “I have a proposition for you,” said Mhumhi, feeling the fire heating up his rear. That seemed to catch everybody off-guard, even Sekayi, who turned back with the filthy pillowcase dangling from one hand. Hlolwa spat out a piece of bandage, tonguing the roof of her mouth distastefully. The smell of infection from Kulwe’s leg was evident even from a distance. “You claimed you were going to have puppies,” said Mhumhi. “Claimed, yes.” She tilted her head at him, mocking. He could tell Hlolwa had not been expecting this, for she raised a paw, and glanced down at Kulwe. “A strange proposition,” she said. “We’re talking about it now,” said Mhumhi. “That all depends,” said Hlolwa. Kulwe, lying in the dirt at Hlolwa’s feet, gave a small tremor and shut his eyes. “Is it so bad?” asked Kutta, stepping closer, her nose twitching. Hlolwa ignored her. Kulwe opened his eyes wide and gave a snarl. The hair on Hlolwa’s back rose. Mhumhi gave an involuntary growl, but his head jerked roughly to the side. Kutta had grabbed him by the ear. “Don’t speak that way about the Madame,” said Kulwe, trying to raise his head. Hlolwa rested one of her paws on his side, and he turned his nose upwards to her. Mhumhi knew that if he did not answer her right away, he would damn himself and everyone else; but he could not help but glance back at Tareq, who was sitting by the hole they had dug together, his round face filled with vague worry. “I see,” said Hlolwa, and Mhumhi knew his chance had passed. “What will they eat?” Hlolwa cast her gaze around at the expanse of the dump around them. Uncharacteristically, Kutta did not turn back towards him. She had cast her eyes downwards. Mhumhi noticed that Mini was also very quiet, licking her lips over by the fire. They knew, he realized. Perhaps they had known all along. There was only one place where all the meat could have come from. Sekayi had gone, Mhumhi realized. He hoped that the bouda had left in time to miss most of the latter half of the conversation. He shut his eyes and went into the concrete house and lay down in the middle of the the cold, hard floor. He lay there for a long time. He heard the others start to shift around again, on the outside- the soft voices of Tareq and Kutta, the whines of Kulwe, no doubt under his Madame’s ministrations. There was no further discussion of Mhumhi’s proposition. He heard his heartbeat thudding where he had one ear flattened against the concrete, and wondered when he had become such a loathsome creature. He must have fallen asleep for a little while, for when he came to it was dark, and there were others in the concrete house with him. Not very near to him, though- he could see what must have been Tareq and Kutta huddled together in one corner, breathing softly. He raised his head, but hesitated. He did not go over to them. He saw that Mini was there, on Sekayi’s chair, her eyes gleaming a little. Awake, and looking at him, but silent. He felt that he did not want to speak to her very much at the moment, whether or not she had agreed with him. He got up slowly, trying to be noiseless, and walked into the next room where the refrigerator hummed softly. The fridge hummed, and from within there was a soft ch-chunk noise of ice settling. Mhumhi took in a slow breath, then dug his claws into the dirty rubber that formed the seal around the door, pawing it open. The light flickered on inside, illuminating him, and he glanced back behind himself almost guiltily. No one stirred in the other room. He turned back, eyed the fresh meat stacked precariously on the metal racks within, then selected an egg from one of the shelves inside the door. It swung shut as he withdrew his head, leaving him in darkness again. He dropped the egg on the floor and heard it crack. He put his nose on it and drew his lips back. The smell of it made his stomach turn. It was boiled, too, and the shell clung stubbornly onto the smooth white flesh within. He rolled it on the concrete with his nose, making it crackle. From outside there came a howl, and Mhumhi froze. Through the doorway he saw the Mini’s ears prick up over the wood panel on the back of the chair. The silhouette of his sister crossed the space. “What was that?” he heard her ask. There came another noise, and not a human nose- the low hoo-bark of a painted dog. “Sekayi!” cried Mini, and she burst into furious yapping. The chair rocked back and forth. Kutta’s form darted low for the door, and Mhumhi ran to catch up with her. She gave him a quick glance as Tareq let out a little whimper. “Hurry,” said Mhumhi, jerking his head, and they ran out together. The moon was half-full, and by that an the bright starlight they saw blood running over the dirt around the vacant fire pit, down from the side where they had held the painted dogs captive. And there was Sekayi, lying facedown, and unmoving. 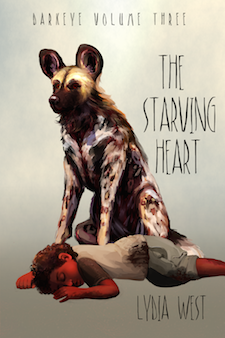 “Sek-!” began Mhumhi, starting forward, his heart thudding with horror, but Kutta stopped him with her shoulder. He realized what she meant. Kulwe was lying beside Hlolwa’s stake, panting. From the stake itself lay the chain- in a limp pile on the ground. Mhumhi noticed this in a split second, and tensed himself- what would it lead to, a frantic search, or bloodshed, or murder, or all three? But then a dark shape stood up behind Sekayi’s body. Hlolwa herself. “What have you done?” cried Kutta. Hlolwa looked at them. There was blood on her muzzle, and her eyes were wide. Mhumhi sensed something off about her demeanor. “He freed me,” she said. “Sekayi-!” said Kutta, shutting her eyes. Mhumhi’s heart sank. Kind-hearted Sekayi… Of course. Of course. He ran forward, heedless of Kutta’s whistled warning, and sniffed Sekayi’s body. Hlolwa stood stock-still behind it. “I attacked him,” she said. Mhumhi looked up at her. Her eyes were very wide, and they reflected moonlight, gleaming nearly green. Hlolwa sat down. Mhumhi was sharply reminded of the moment when she had seen Imbwa’s body- her eyes had the same dull cast.